So there was this dude from back in the day. He’d gotten himself into some pretty serious debt (the equivalent of millions of dollars) by borrowing from the king of his land, and on budget-balancing day, the king decided he wanted everything settled up. As you’d guess, the guy didn’t have the funds to pay it back. So, as was the custom of the day, the king ordered that everything this man had be sold so the man could make good on his promise of repaying the debt. This included the man and his whole family being sold into servitude to settle the account. The king, even though he had every right to demand repayment, was filled with compassion toward this man, and made a decision. He decided to let the man go free, not just to have more time to pay back the debt, but to be completely free. He released him and canceled his debt completely. The man’s debt had been erased. He owed nothing. He was free. So, of course, this man lived a long and happy life, forever grateful for this freedom, and extended the same grace to others that had been extended to him, right? That dude went right on out, came across a guy who owed him some money (the equivalent of a few thousand bucks) and grabbed him by the throat, demanding he pay back the money this instant. This man also couldn’t pay back the debt, so the dude had him thrown in debtor’s prison. Oh, Peter, you’re so adorable. You thought seven times was a lot. I’m with you. Jesus said the Kingdom of God plays out like this parable. God is the king. We are the ones in debt to Him because of our state of sin. He has fully and completely forgiven us, no matter how much of a mess our credit history is. So when we go out into our world, He expects us to transfer that mercy to others. He expects us to remember our great debt that we couldn’t repay, and to offer the same forgiveness to others. But there’s one thing this parable doesn’t tell us. It’s the part we figure out for ourselves when we put in to practice what Jesus said to do. It’s the hidden gem that we get from obedience to this practice of forgiving. When we free someone from their debt, we become free as well. In fact, the freeing is more for us than for them! 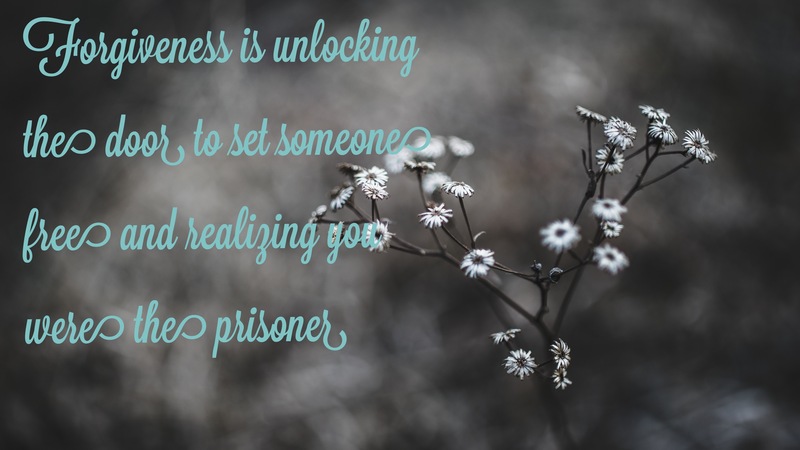 Unshackling someone from us by forgiving their betrayal, their insensitivity, their part in our abuse, their coldness, their poor parenting, their lack of love and understanding… Whatever the case may be. Releasing them in your heart and mind releases us as well. We get to live more freely and move forward with what God has in store for us. Forgiving is no easy task. It’s not a one-time deal. It’s a choice we make over and over to extend freedom as it has been extended to us. It’s a process of renewing our minds to allow God’s truth about us and our situation to permeate every place in our lives, so we can really live. It doesn’t mean forgetting. It doesn’t mean acting like nothing every happened (in fact, the very act of forgiving someone means that there has to be an offense that needs forgiven in the first place.) It doesn’t even mean reconciliation with the person in every case. But it does mean freedom. This week has been a tough one. I’ve been working through this process of forgiveness toward someone that, quite frankly, doesn’t really “deserve” my forgiveness. This person did something terrible to me, on purpose. They treated me in the worst way a person possibly could. And they’ve never once said they were sorry. They haven’t even acknowledged their wrongdoing. They’re just going about their everyday life as if nothing ever happened. And chances are, I will never hear an apology from this person as long as I live, even though I certainly am owed one, and much more. My life has been changed by the way this person has done me wrong. It’s been devastating. Life-altering. It’s cost me hours and hours of distress and thousands of dollars in counseling. It’s created anxieties in me that I’ve never had before. It’s made me act like a person I’m not, on more than a few occasions. And I am tired of living that way. Having a bitter undercurrent just below the surface of your life is no way to live. And honestly, nothing this person could ever do or say would really take away the hurt that has been imposed on me. It’s forever affected my world. So rather than waiting forever to get the apology I’m owed that will never come, (and wouldn’t really help much if it did) I’m working on being obedient to this command of my King. For my own sake. For freedom. I begin by recalling a debt that I owed, that I couldn’t repay. I remember how I have been forgiven of that massive debt. How I could never make it right even if I tried. And I decide to forgive my debtor as I have been forgiven. This doesn’t come easily. But with God’s help, I start by transforming the way I think of this person. In a very practical and tangible way, I write down everything I think about the person (everything—no holding back. God knows anyway.) And then I search the scriptures and write down the truth about this person, as God sees them. As he sees all of us. ______ is an awful person. _____ doesn’t deserve forgiveness for this. How could someone do that to me? To anyone!? I don’t have to like this right now. I don’t even have to believe 100% that these things are true about this person. Yet. But I will. Because God’s words ARE truth, and truth will win every time. I will continue reviewing these thoughts vs. God’s truth (and the many other pairs such as this that I’ve written down about this person I’m forgiving) and trust that I’ll be transformed by the renewing of my mind. I’ll make the decision to release them from this debt they owe me, because I want more freedom. And forgiveness is the way to go about getting it.